Ash Gaming bring us another online video slot for the Playtech powered online casinos. Ash Gaming are now developing and releasing some of the best viseo slots on the market, with new and exciting bonus features and games. Read our online slot review and get some free spins today. This new Ash Gaming video slot is huge.. It has a whopping 100 paylines, one of the biggest we have ever seen from the top slots developers. The 5 reels each contain 4 symbols for the bigger win possibilities. and because of the amount of paylines you can have bets from as little a 0.2� per line, right up to �1 per line. Due to the number of paylines and symbols the win frequency is high but the win amounts are low. The game is all about the fashion industry, centering on New York, Madison and 5th Avenue. It is quite a slow moving game, there is no TURBO button so the spins can seem lazy. The reels do feature a WILD and BONUS symbol. The wild symbol can appear anywhere on the reels. If two WILD symbols appear on the same reel they will expand to cover the entire reel for a stacked wild feature to increase your win prize. Quite a good game with regular wins. 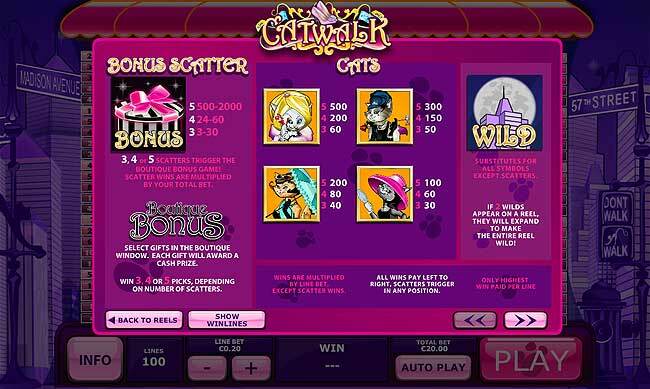 The game does feature a bonus round, hit 3 or more BONUS SCATTER symbols and you will enter the BOUTIQUE BONUS. In the boutique you are presented with many highly fashionable items, you get three, four or five picks and choose the items you most desire. Each item will reveal a cash prize. 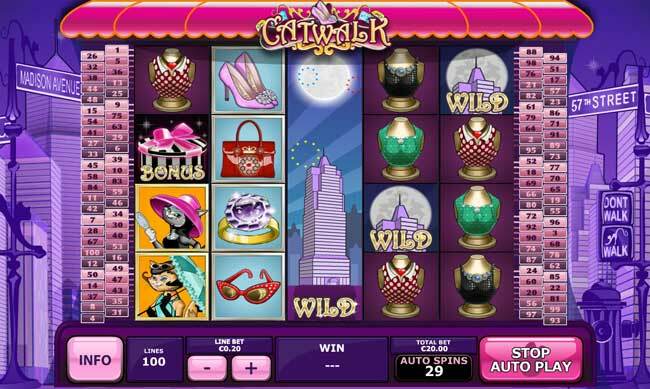 The huge amount of paylines make this game just a little bit special, this and the cash bonus game will be a big hit. Click the "PLAY NOW" button below to play for real with a huge free spins and cash match welcome bonus.